We’ve all noticed that in the past decade, social media has emerged to become a very popular way to stay connected and informed about recent news and developments throughout the world. Social media has become a revolutionary platform for information sharing, discussions and helping businesses to build their online reputation and identity. Because of its popularity, social media can be used as a powerful marketing tool for any business looking to sell their service or products online. A basic strategy used in social media marketing is the production of content to attract user attention and subsequently encourage them to share it with their friends and network. Facebook, Twitter, LinkedIn and Google plus are just some of the most widely used social networking sites. Upon the initial stages of attracting attention and sharing, the final stage would ultimately conclude with your product or service been purchased. Now the question, why social media? It has been found that marketing done through social media generates increased business exposure and more trust to the branding. With a solid 77% of consumers saying they’re more willing to purchase a product/service if the head of the company is actively seen engaging with customers, this is certainly one concept which can not be ignored. 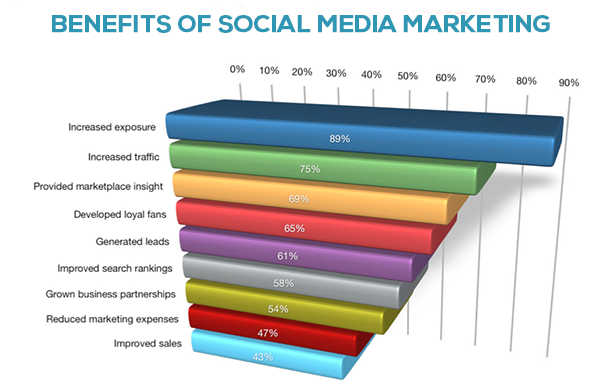 Apart from brand exposure, there are numerous other benefits of social media marketing. Social networking websites are a boon for professionals who are willing to connect and stay in touch with other professionals from the same industry or same interests. LinkedIn has this trait as its prime feature. If somebody is looking for collaboration with peers then LinkedIn would act as the best and most feasible platform. Harnessing the power of social media will make an individual capable of finding the right person and knowledge required to achieve his/her goal. Finding and connecting with people in the right industries may result in increased brand awareness for your company, increased authority and overall web presence. The effective and efficient use of social media can work wonders in educating and empowering a particular community or group. Posting videos, blogs and writing articles on social networking sites related to your business can be very helpful in revealing the personality and expertise of your organisation or business. This process is commonly known as inbound marketing and also acts as a powerful channel of SEO. The first thing that should be kept in mind before engaging in any social media marketing strategies is to register your business onto the biggest social media platforms. We can opt not to go for every social networking site but it is very vital to register at least the top ten social networks. The other essential of social media marketing is to create brand awareness and stay consistent with updates on all the registered channels. Furthermore the complete strategy for social media marketing should be well planned in taking into consideration all the potential problems. 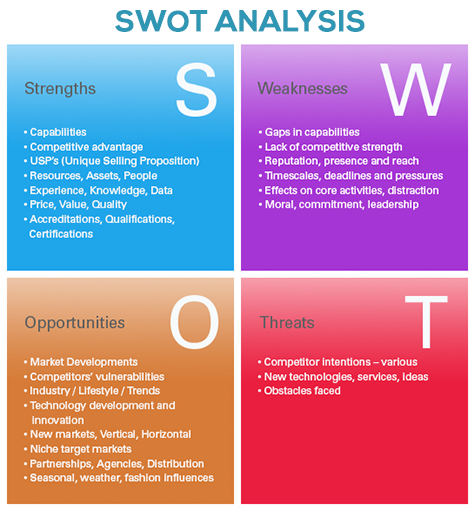 Doing a SWOT analysis is a very good method to thoroughly analyse your strategy. One such SWOT analysis is shown in the diagram below. To efficiently execute any plan, resources will play a significant role. Whether it be people, tools or budget; all are significant elements of successful social media marketing. It is highly essential to hire and allocate the right people to complete the right jobs. To ensure and evaluate the growth of the business, expert advice and monitoring is highly recommended. Another very crucial essential is the integration of the registered channels for the brands so customers can easily navigate from one platform to another and share the information and knowledge to maximise audience reach. Content which has proven to be highly effective include company news, awards, advertisement videos, blogs posts, reviews and articles. We can also share the related content on various web 2.0 properties such as Reddit or Stumbleupon. Stay on top of what’s happening around your industry so content creation ideas become less of a burden and become more of second nature. Try actively engaging with popular forums and news websites related to your industry to maximise ease of your content creation efforts. Share latest trends, updates or special deals that are occurring around your serviced areas. To sum this post up, find out exactly what appeals to your target market and start distributing content across various social media platforms to find which ones work best. Testing and executing will be key to success.